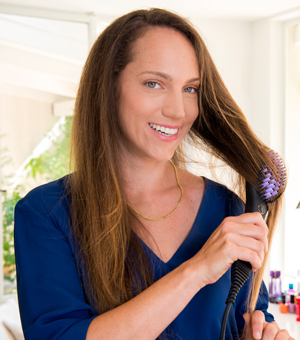 Easy to use: Simply brush your hair. 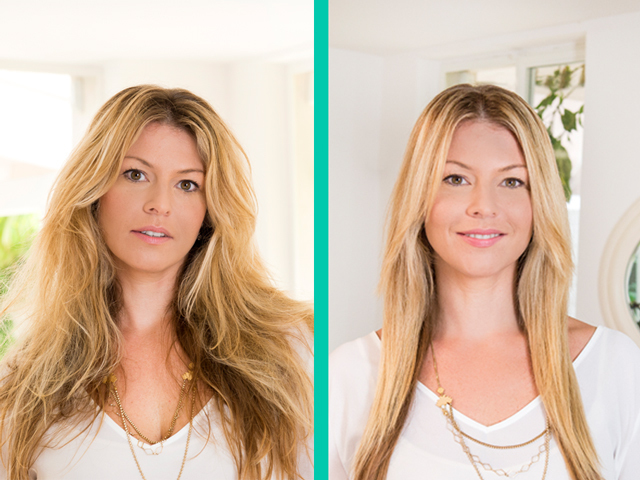 Saves time: Perfect hair in minutes. Safer for your hair: Heats up to exactly 185°C, proven to be safe for your hair. Perfect hair: Anytime, anywhere - in just minutes. Unique design: Easy to handle and covered with ceramics for beautiful hair in no time! Perfect hair - every day! STRAIGHT, SMOOTH AND SHINY HAIR WITH A PERFECT HAIR STYLE! SHOP NOW! Curly hair? Frizzy hair impossible to handle without a straightener? Do you also wake up every morning aggrevated even before you see your hair in the mirror? First, you need to wait to heat up the straightener and then it takes ages to do your hair? Forget about the usual straighteners and flat irons - today! Upset by the fact that your hair is leading a life of their own? Well, so was our boss Sharon, you'll be inspired by her story and her solution! Sharon was one of those girls whose hair is impossible to manage. One day, after being fed up with her hair, she simply cut her hair short. Her friends and family had a ball making fun of her - she heard it all - you look like a boy, what's that on your head, and all the rest of them you can relate to. But her father, an inventor and a senior engineer took her problem seriously. With a vision of helping he first created a Frankenstein-like prototype brush that actually worked. It straightened Sharon's hair. The next step took the engineer and his daughter two years, but they perfected the brush to the point we can proudly present you the revolution of hair straightening. DAFNI started out of a family basement, and is becoming the leading innovation for hair straightening - an attractive, innovative device that helps thousands of women save so much time and effort. They named the brush after Sharon's younger sister Dafni and since the launch in the beginning of 2015 it has hit home with so many women with frizzy, wavy and unmanageable hair. Keep it at home and take it with you - for the perfect hair anywhere, any time. NEW GENERATION OF HAIR STRAIGHTENING! SHOP NOW! Fast - perfect hair in no time. Dafni heats up in less than two minutes, letting you know with a sound and light signal. Easy as brushing your hair. Take a strand of hair and slowly glide it through Dafni bristles. Voila, your hair is straight! Handy for everyday use and on special occasions - Dafni is ready to go wherever you need it - with a solid construction and a long cord it will do your hair every single time. Safer for you hair and scalp: The tips of the bristles aren't ceramic but covered in gentle rubber to protect your scalp, while the ceramic (purple) part will heat up and stay heated at exactly 185°C - straightening has never been safer for your hair or your scalp. 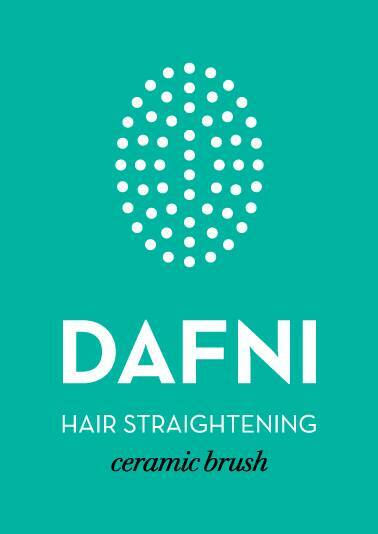 For all hair types: Dafni can be used on really curly, frizzy or wavy hair. It smooths the hair and helps you turn the tips inwards or outwards. You can straighten your hair perfectly or just hide those short hairs spoiling your do. 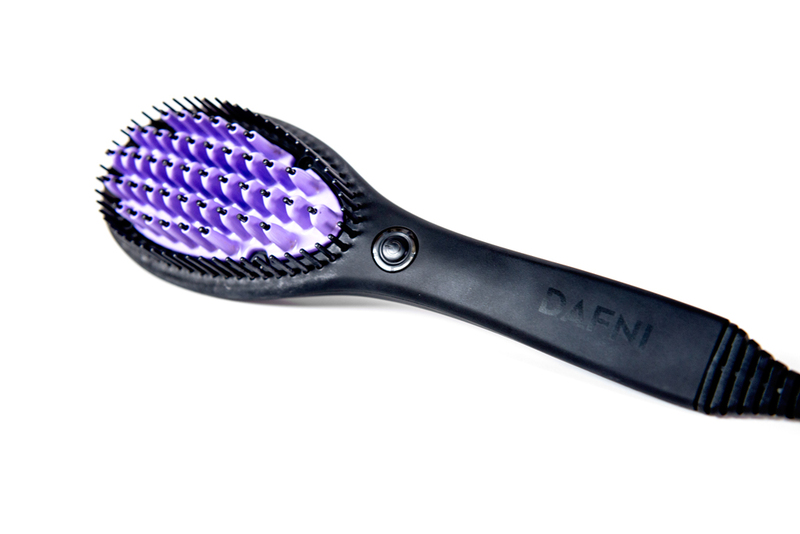 DAFNI is a revolutionary hair straightening brush, helping you straighten your hair while brushing. No fuss, no clips. Just brush it! DAFNI cares about your life-style. 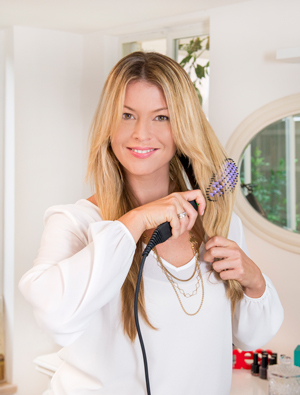 With DAFNI you can straighten your hair in minutes. Ready · Straight · Go! DAFNI was designed specifically for the top recommended temperature - 185˚C, which remains practically the same during each stroke. For smooth, healthy hair. READY - STRAIGHT - GO! SHOP NOW! Curly, frizzy hair? Here's your answer! DAFNI has been introduced to several countries, and the women don't like it, they LOVE IT! TURN IT ON: Plug DAFNI in and press the button. When it's ready you'll hear a short beep and get a green light on the button. While heating up, DAFNI should stand on firm, solid surface, bristles facing up. 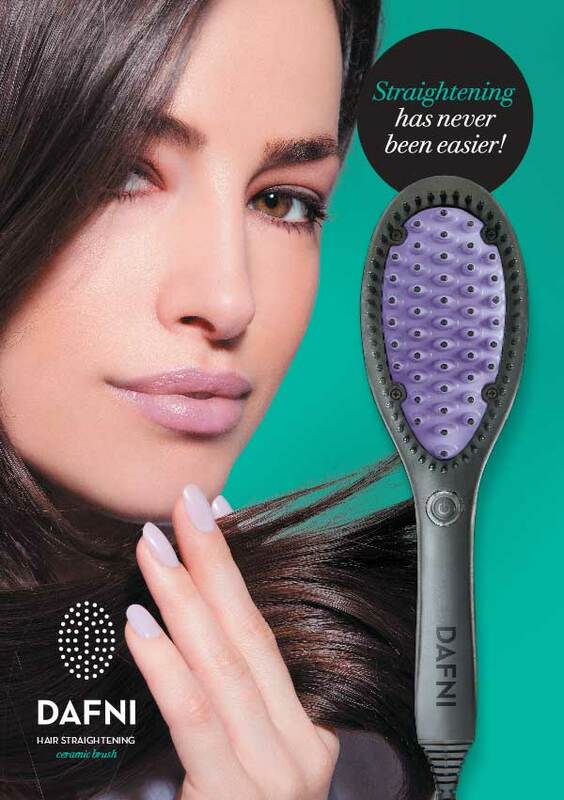 On dry hair only: DAFNI (just like your usual straightener) should be used only on completely dry and well brushed hair. If you're in a hurry, dry your hair with a blow dryer, then use DAFNI. Strand by strand: Brush your hair before you use DAFNI, then hold strand by strand and glide it deeply and slowly through the bristles, getting the hair as mush as possible in contact with the purple surface of the brush. Glide root to tips slowly. Make a compete hair do: Don't forget to use DAFNI on your tips - you can turn them in or out. Just make sure the hair gets deep between the bristles and let the ceramic coating do all the work. READY - STRAIGHT - GO! Do you love your hair? So do we! SHOP NOW! can be used at home and is even suitable for professional use. Such a simple idea, creative solution and just perfect hair! While professionals are nodding with approval, the users scream "finally"! "Love how easy this brush is to use, I also REALLY LOVE this it allows your hair to keep some volume. When I use my flat iron my hair looks too too straight. This brush helps to leave my hair looking styled but not flat." The best thing about DAFNI? Quick and easy, for the perfect polished look! "I have thick, long, wavy, and frizzy hair that has a mind of its own. Styling my hair takes a very long time, so I tend to throw it up in a bun since leaving it natural is not a pretty look. Dafni is a complete game changer for me! After letting my hair air dry I can straighten my hair so fast with this tool. I love that it gives me smooth, straight hair with a polished look. It’s bouncy, and not stick straight like if I used a flat iron." Just - my favorite tool! DAFNI rocks – my new favorite tool! "I tried this brush in Italy and fell in love. It’s so simple to use. Took my wavy hair to silky smooth in a few minutes. So much easier than a flat iron. I’ll use my every morning on the way out the door." Just take a look at the video! "I used to wash my hair once or twice a month because they become impossible to manage after washing. My friend would straighten my hair and it would look nice until the first rain or damp in the shower. I have the frizziest hair ever, I'm blonde with Afro-like hair, there was no hope! And when my hair dresser introduced me to DAFNI, I nearly cried! This is it, exactly what I needed! I love it, I just love DAFNI and my hair now." I really do have more hair then normal people, but it takes me up to 5 minutes. It works! "With my curls I thought I was doomed for good. You know how it goes - if you keep them long, the ends are split. If you cut them just a little, they look so short like a boy's hair. And doing my hair so easily every morning is nothing short of a miracle - DAFNI, I love you!" Absolutely! If it works on my really curly hair, it will work on any hair! Can hardly believe it's true! BAD HAIR DAY - EVERY DAY? HERE'S THE ANSWER!SHOP NOW! What makes DAFNI different? Oh, that's easy - the most natural movement for doing our hair is brushing and a plain old straightener can't help you with that. 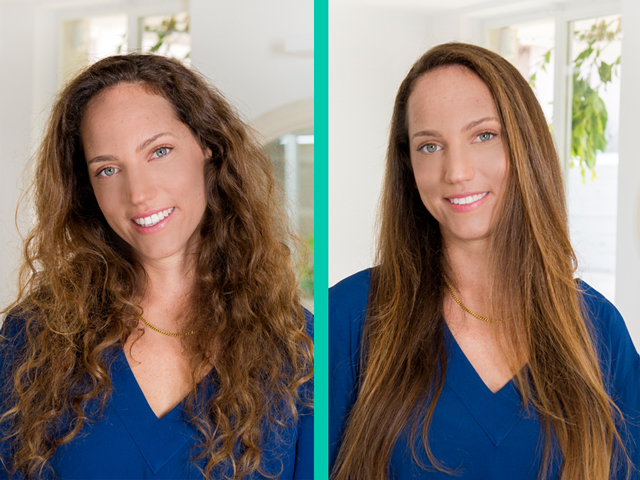 DAFNI makes hair straightening as natural and as easy as it gets. 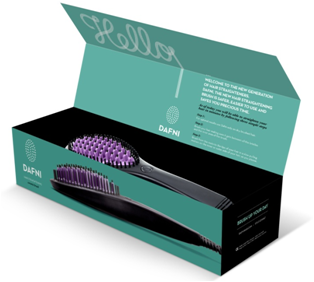 Curly hair, frizzy hair, wavy hair - straight in no time - DAFNI's unique 3D surface is much wider than with ordinary hair straighteners, meaning you can straighten your hair in minutes - two to three minutes. 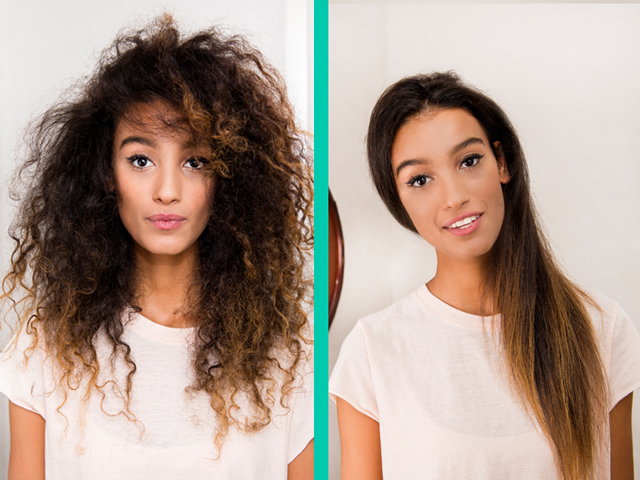 Yes, your hair will really be straight in minutes! How to use DAFNI? Please check the information above and make sure you see the videos attached. Basically, use it on dry hair just like your normal brush, but in slower movements. All of our customers confirmed that they got used to using DAFNI in two to three days - and would never go back to the old straightener. Three minutes? Really? Really. Because of its unique and handy shape straightening is fast and simple - it will take in average 1/10 ot the time you use with a plain straightener. Can I hurt my scalp? 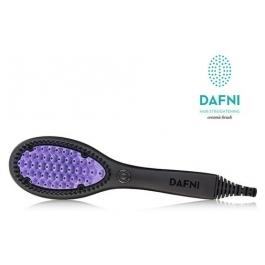 DAFNI is designed in a very special way - only the purple part is ceramic and heats up, while the top of the bristles are made of special soft rubber, preventing the ceramics to touch the scalp. So all you have to do is be careful you don't press the purple part of the brush against skin (like fingers and ears), and you should be fine! Ceramic? What do you mean ceramic? The purple parts are covered in top notch ceramics that ensures fast and even heating while being the safest for your hair. How long does it take for DAFNI to heat up? Less than a minute! Plug it in, press the button, wait for beep and green light and you're good to go. The temperature stays even the entire time of straightening so the hair is straightened evenly and easily. Even professionals love it - it's easy to use and super efficient! Is DAFNI safe for my hair? Would you believe we tested more than 40 appliances and DAFNI proved to be safer than all of them. The temperature of the ceramic surface is even and constant - at 185°C, meaning it doesn't hurt the hair by heating to 220°C like your normal straightener. You have to know that by locking your hair between two surfaces of 220°C heats your hair even above 300°C - causing real damage to the hair fibers. How to clean DAFNI? When your brush is cool and dry (unplugged, of course) take a very soft brush or cloth and wipe between the bristles. Almost no cleaning will be necessary if you use DAFNI on dry, clean and brushed hair. Mush faster and easier hair straightening. Ceramic cover to protect your hair and super easy straightening. Hello, this is the CEO of the distribution company. To find the best for our customers, our IT manager and I set to Bologna Cosmoprof in 2015 and after an hour or so he asked me what exactly I was looking for. I said, something new, innovative, some hair straightening product that will work better, faster. And not a minute later I noticed DAFNI's boot - THIS is what we're looking for! And my first thought was - how am I going to convince them to give the distribution to us? We're a small company, and have plenty of serious competition as far as distributions goes, but I have to have this! Months have gone by with me calling and e-mailing the manufacturer, literally begging :) At one point I thought OK, this is it, they're going to give the distribution to someone else. But magic was on my side - one day, Sharon called and said: "Hana, we'd like you to tkae the distribution." Wooooohoooo! The happiness, joy and the ultimate desire to help women with wavy, curly and frizzy hair is what got us here. And here is you opportunity to get your own DAFNI.